Climate change is becoming a global issue. Scientists, environmentalists and other research and development wings all over the world are focusing on reduction of Green house gases (GHGs) especially Carbon dioxide (Co2) and Methane (CH4). Watershed management is one of the ways of managing the ongoing Climate changes along with conservation of Natural resources. It will be difficult for Watershed projects to achieve its prime objective of conservation of Natural resources due to increasing adverse impacts of Climate changes on existing Natural resources . Enhancing forestry plantation and Cultivation of Crops and grasses are some of the Watershed interventions that are taken up in Watershed projects. On one side, it helps in Conservation of Natural resources and other side it helps mitigating the adverse impacts of climate change through an increase in soil biomass. The atmospheric Carbon is taken up by the plants for the much needed Photosynthetic activity. This way the Carbon in atmosphere gets absorbed in plants and later gets in to the soil with decomposition by microorganisms in soil. The source and sink relationship has to be enhanced for diverting atmospheric carbon in soil. 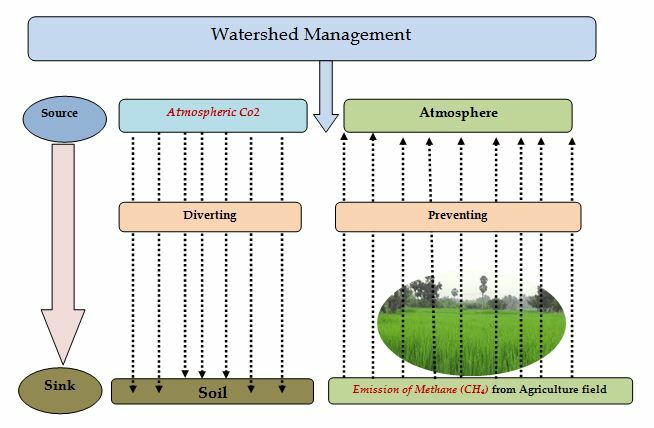 Along with Carbon emission, the emission of Methane from Agriculture field is also becoming a big issue. Watershed management has to focus on climate change and mitigates its adverse effects so as to enhance the prime objective of Conservation of Natural resources.